Is AstraZeneca's Dividend in Danger? With patent expirations arriving and a pipeline still years from potential success, this top Big Pharma dividend is looking at a tough road ahead. Big Pharma is home to some great, high-yielding dividend stocks, but no company in this industry offers a bigger dividend than AstraZeneca's (NYSE:AZN). The British company's stock boasts a 5.1% dividend yield, which has tempted investors and rewarded shareholders over the long term. Dividends are unparalleled in their capacity to rack up gains for savvy investors and portfolios over time, but if the stock -- and business -- behind a payout isn't up to par, shareholders can be left out in the cold. AstraZeneca faces a few monumental challenges that have put this dividend stock in just that kind of danger zone. Three of the company's top-selling drugs have faced or will soon square off with the patent cliff, possibly costing AstraZeneca billions of dollars in annual revenue. So what does the future hold for this high-yielding dividend and the company's investors? For all its looming challenges, AstraZeneca's stock has performed well lately. 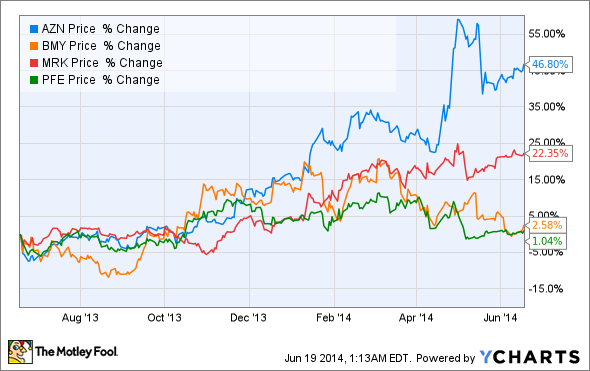 Over the past year, shares have easily outperformed top competitors' stocks. AstraZeneca has also maintained a sturdy history of raising its dividend. The company hiked its yield for several years, although the dividend has been flat since 2011. Compare that to the likes of Bristol-Myers Squibb, another of Big Pharma's best dividend stocks that has consistently raised its dividend over the past five years. Bristol also pays less for its smaller 3% yield, maintaining a cash dividend payout ratio of under 60%, slightly less than Astra's roughly 64%. Of course, the numbers could get significantly worse considering that AstraZeneca's patent reckoning is at hand. Investors have already had a painful taste of the patent cliff: AstraZeneca's Seroquel IR, an anti-psychotic treatment that made more than $4 billion in revenue in 2011, lost patent protection in 2012 and made less than $350 million last year. Now Nexium is up to bat. AstraZeneca's famous "purple pill" for acid reflux lost patent protection in May, and India's Ranbaxy Laboratories has acquired FDA approval for a generic. Nexium made more than $3.8 billion last year as AstraZeneca's second-highest selling drug, contributing more than 15% of the drugmaker's overall revenue. Losing significant sales this year will severely threaten the company's flexibility in raising its dividend in the near future. However, AstraZeneca has been given a surprising gift for 2014: U.S. regulators banned Ranbaxy from selling drugs in the United States that include compounds from a specific lab in India, forcing the generic drugmaker to seek ingredients from elsewhere and potentially buying AstraZeneca more time to keep selling Nexium. Nonetheless, while Ranbaxy's stumble might add a little to its rival's top line this year, AstraZeneca investors need to brace themselves for a difficult future for Nexium. Nexium is not the end of the pain, either. AstraZeneca's top seller, cholesterol-fighting Crestor, faces its own patent challenge in 2016 that mirrors the trouble faced by one of its rival drugs, Pfizer's Lipitor. Lipitor, once Pfizer's (and the world's) top seller, lost patent protection in 2012 and has seen annual sales plummet more than 75%. Crestor accounted for more than 21% of AstraZeneca's sales last year. A similar drop-off without new growth to counter it would be devastating. Executives are confident that AstraZeneca's pipeline can pick up some of the slack, but things could get ugly if the company cannot meet its leadership's lofty expectations. Can this vaunted pipeline live up to its promise? Of all AstraZeneca drugs that sold more than $1 billion last year, only Symbicort -- the respiratory therapy that racked up nearly $3.5 billion in revenue in 2013 -- showed promising year-over-year growth. Symbicort, however, competes in a tough market, and while its 9% sales gain last year was promising, the drug recorded less than 1.5% year-over-year growth in 2012. AstraZeneca will need this drug to reel in more of the former and less of the latter in the coming years while it tries to push its pipeline forward, especially considering the modest revenues made so far by up-and-coming drugs such as diabetes treatment Byetta, which analysts have pegged as a blockbuster candidate. AstraZeneca also won FDA approval earlier this year for diabetes therapy Forxiga, another drug that analysts have projected could emerge as a blockbuster. However, it is yet to be seen how it will manage in the competitive diabetes marketplace. AstraZeneca's biggest hope -- and the best source of optimism for wary dividend investors concerned about the future -- is the company's pipeline. AstraZeneca projects sales of $45 billion in 2023, up 75% over 2013. The key catalyst? The company has pointed toward its cancer-fighting pipeline as the brightest option, with CEO Pascal Soriot noting that the immune-oncology development is progressing at "a rapid pace." Analysts have acknowledged the potential behind AstraZeneca's pipeline, but to date it's much more potential than reality. According to the drugmaker's most recent pipeline update,, AstraZeneca plans to file for FDA approval of most oncology candidates that are now in phase 3 trials in 2016 or later. AstraZeneca has touted the potential behind its PDL-1 inhibitor MEDI4736 as well. This class of drugs has been a big hit around the industry, with numerous companies looking to launch their own anti-PDL1 drugs. Yet MEDI4736 only recently posted successful data from early stage trials. While the results were strong, AstraZeneca will need to carry over that success into later-stage testing before investors can firmly accept a promising future for the therapy. While that pipeline carries plenty of strong drug candidates, AstraZeneca still has a long way to go to make good on the prediction of $45 billion in annual sales by 2023. The drugmaker has opened up to merger and acquisition activity, even in the wake of Pfizer's failed bid to acquire AstraZeneca. That could help bolster the pipeline, but for now, Crestor's and Nexium's patent losses appear set to inflict a significant blow in the short term to AstraZeneca's financials. What does that all mean for the company's top-notch dividend? Expect AstraZeneca to fight tooth and nail to at least keep its dividend flat, but with the company forecasting a sharp drop in earnings this year and Crestor's patent expiration on tap to inflict more top- and bottom-line pain in 2016, that may be a tough goal to reach. If AstraZeneca can live up to the promise of its pipeline in the long run, this company will emerge strong and with its dividend in a great place. But with limited growth and tough patent losses coming in the next few years, dividend investors should brace for a rough trip.